I occassionally offer the ponies for weddings and corporate events such as promotional pony rides or a pretty pony for marketing material. I’ve been asked to provide a pony/ponies for TV ads and promotional pony rides. I’m happy to consider and offer suggestions for your particular requirements. I can provide one or two ponies for pony rides or just for photographic opportunities for up to an hour and a half. 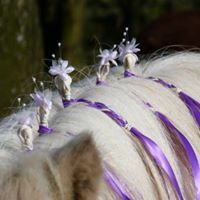 I generally decorate the pony’s mane with delicate flowers matching your colour theme or white/ivory to match your dress. Prices start at £425 but very much depend on where you are. I’m happy to travel within approximately 30 miles of Chester. Please call or email to discuss your requirements and dates.